Jr. Weekend is just around the corner. Registration is now open. Cost is $100 until February 14, 2018, after that it will be an additional $15 late fee. Link to register and pay online. 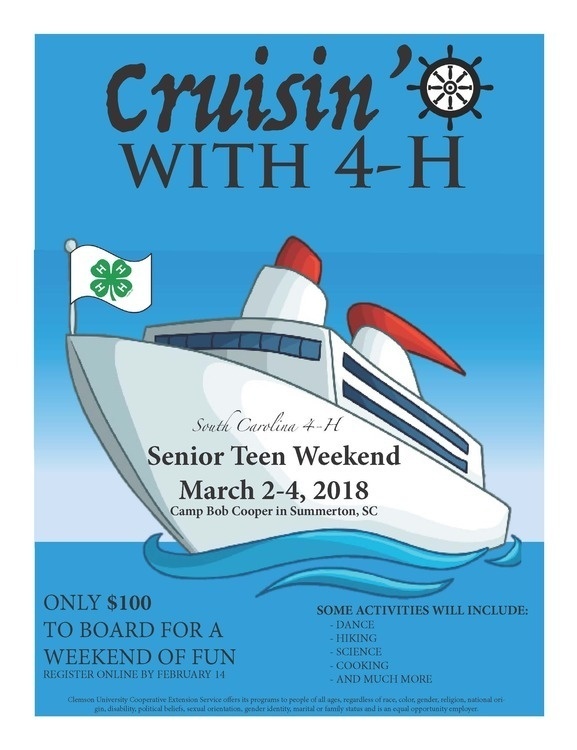 For more information contact the State 4-H Office at 864-656-3848. 2. Turn right, drive 1.5 miles. 3. Turn left at the stop sign. 4. After 2 miles, go straight through the first stop sign. 5. After 4 more miles, turn right at the second stop sign onto Rickenbaker Road. 6. Drive 7 miles until the road ends at Camp Bob Cooper. 1. Take Exit 115 toward Summerton. 3. Turn left onto Rev J.W. Carter Road. 4. At the stop sign near Davis station, turn right onto Moses Dingle Road. 5. Take immediate left onto Rickenbaker Road. 6. Drive until the road ends at Camp Bob Cooper. No problem! Call (803) 478-2105 for directions.